Terry Deno, the council’s chair, says the note likely refers to two apartment complexes being pursued respectively by development companies Morning Side Investments LLC and Diamond Rock Construction Inc. Both are seeking amendments to Spokane’s comprehensive plan that would allow two new apartment complexes to be built in the neighborhood, which is primarily single-family housing. Deno says that residents are concerned that the new apartment complexes will greatly change the nature of the neighborhood, bringing more traffic and density with potentially 1,400 apartments. “It would be like putting a little town in Indian Trail,” he says. “Please save yourselves time, money, and pending lawsuits and cease and desist with this nonsense. If you don’t like it, MOVE!! !” reads the notes. “It seems odd that someone would go to that effort to put something out like that,” says Jay Bonnett, the owner of an engineering company representing Morning Side Investments LLC. 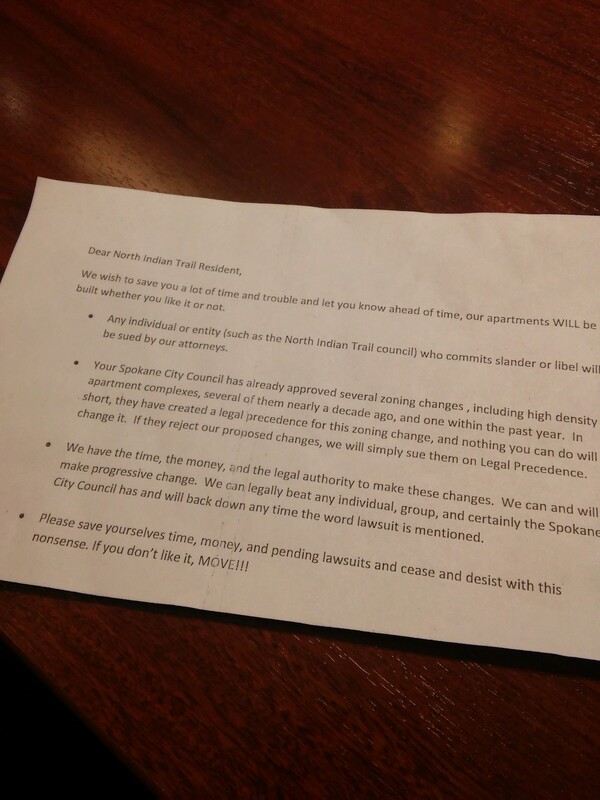 On Friday afternoon, both companies attached their name to a statement issued by Spokane City Council President Ben Stuckart, Indian Trail Neighborhood Council and Jonathan Mallahan, division director for Neighborhood & Business Services, in condemning the notes. Jim Bakke, a North Indian Trail resident, says 136 people were present for the meeting. He was going over the bylaws change when the notes were discovered causing an audible gasp from the audience when one was read out loud.